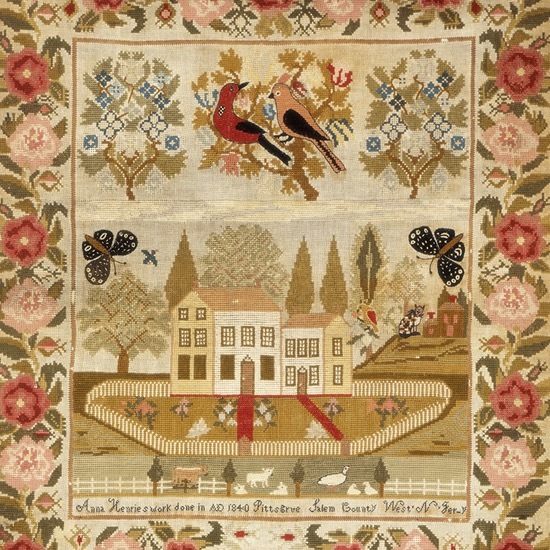 Discover samplers and silk embroideries made by schoolgirls from Maryland and other East Coast states during the 18th and 19th centuries, which were displayed by families as showpieces to advertise their daughters' accomplishments. From opulent to understated, the works provide a glimpse into early American life, depicting landscapes, still lifes, tributes to national heroes, and literary and biblical scenes. One elaborate work depicts the interior of King Solomon's palace and imperial trappings of the Queen of Sheba's entourage in silk, metallic threads, sequins, and glass gems. This exhibition marks the return of the Jean and Allan Berman Textile Gallery, located within the renovated American Wing.